Let’s face it; choosing to live the full-time RVing lifestyle makes you an odd duck to mainstream society. There’s something about planning to get rid of your possessions and live the freewheeling life that makes people a little nervous—and somewhat envious too. Are you feeling like a Martian yet? The good news is that there are plenty of people who do get where you’re coming from—more than you’d ever guess. 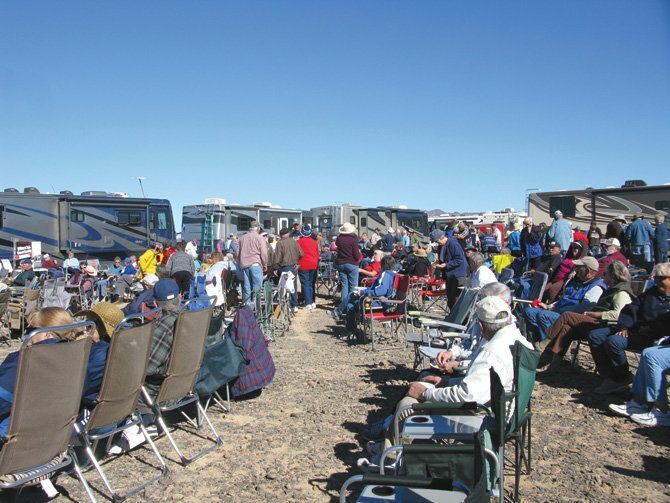 And one of the best ways to ensure your maiden voyage is a success is to travel to an RV rally where you can meet them in person and learn from their experiences. Google the phrase “2015 RV Club Rally” and you’ll discover a variety of rallies held throughout North America—from events that celebrate specific makes and models of RVs to large gatherings with hands-on learning sessions that cover the basics of the full-timing lifestyle. Some RV rallies are gigantic national meet-ups that happen yearly, but most are smaller regional get-togethers for folks who want to stay closer to home. The events usually have some type of entrance fee either included with, or in addition to, camping costs, but don’t let some of the pricier events scare you off; all of them are great opportunities to talk to full-time RVers. If you’re planning a great American road trip by RV, here are three great RV rallies in the West that full-time “dreamers” should make it a point to attend. A special segment of the gathering that any new full-timer should attend is the Escapees RVer Boot Camp, which teaches the basics of RVing. The program includes hands-on driving instruction, RV maintenance information, special elective courses for new RVers, focus groups on motorhome towing and towable RVs, and a full-timers’ discussion panel and Q&A session. There are also opportunities to talk one-on-one with the instructors. For more information, visit escapees.com/BootCamp. If your full-timing plans involve taking the little ones along, make it a point to join the Fulltime Families group and attend its informal Las Vegas rally to be held sometime in late March. The group says, “If you want all your questions answered about what it’s like to live on the road… attend a Family Reunion! It’s like ‘on the job’ training—with a side of s’mores!” This gathering is open to anyone and will be held at a Bureau of Land Management campground, which means no hookups but works out well if you don’t yet own a rig because you can tent camp. Fulltime Families offers support before and during your full-timing adventure in areas such as schooling, budgeting, educational travel itineraries, income building and more. This dues-based group also offers discounts with important RV resources such as Passport America, Workamper, OvernightRVParking.com, Flying J/Pilot Travel Centers, Thousand Trails, Woodall’s and more. I’ve met many single women who want to go full-timing but they feel unsure about traveling alone—and who can blame them? After all, whether you’re male or female, commanding an RV by yourself can be tricky business in some situations and even intimidating for many women like me who delegate RV driving duties to their husbands. But if you’ve got the “hitch itch” to hit the road on your own, or recently lost a spouse but want to continue traveling by yourself, consider attending this RVing Women national rally to see how it’s done. The RVing Women club and rallies provide many opportunities to network, build friendships and learn from other solo female RVers. It’s the only group that specifically addresses the needs and issues of the woman RVer in areas such as safety on the road, health issues and money concerns. RVing Women will hold its national event in Oklahoma in October, but several chapter events occur throughout the country beforehand. Check out the group’s events list to find one near you. In addition to these events, you’ll also find it helpful to attend a rally for the specific make and model of RV that you are thinking of buying. You can talk to owners about their experiences with their RV, and since many rallies are sponsored by the manufacturers, you’ll also get to talk directly to the company’s service teams. Some like Northwood Manufacturing even provide tech support and minor repairs at the rally. For these events you’ll usually need to join the clubs in order to attend, so it makes sense to do your RV research beforehand in order to pinpoint which make/model club to join. If you’re unsure about which model is right for you but you know which type of RV you want to buy (for example, a motor coach, towable trailer or van conversion), consider joining an RV club within that category in order to attend rallies for that type of rig. The Family Motor Coach Association (FMCA) is a large organization for motorhome owners and will hold its next convention March 26 to 29 in Southern California at the Pomona Fairplex. For details, visit fmca.com. Since 2007 Rene Agredano has been a full-time RVer who lives and works from the most scenic places in the country. As a writer, jewelry designer and animal advocate, she travels in a 27-foot Arctic Fox fifth-wheel with her husband, Jim Nelson, and three-legged dog, Wyatt. The trio shares their nomadic lifestyle adventures at LiveWorkDream.com. Follow Rene’s blog, “The Full-Timing Nomad” at rvlife.com.